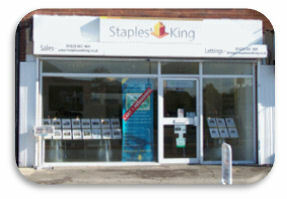 Staples and King Estate Agents is a thriving and established independently owned company established in 2003. We deal with all aspects of residential sales, lettings and financial services and our team has over 90 years of estate agency experience, a reassuring fact when it comes to property matters. We endeavour to provide the highest level of expertise and knowledge that you simply will not find elsewhere locally. With today’s busy lifestyles we make sure we put ourselves out for our customers, giving them the peace of mind that a professional team is taking care of what is usually their largest asset.